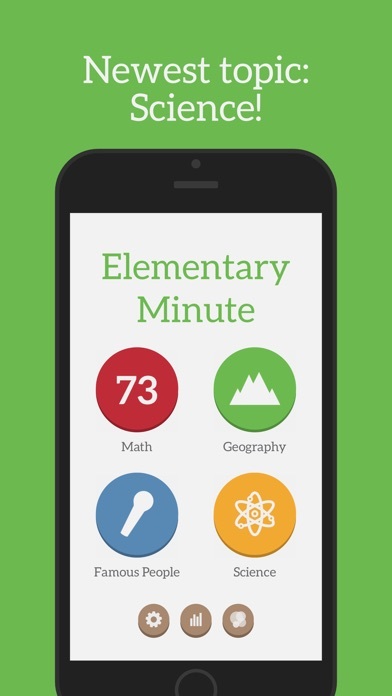 Discussion in 'iPhone and iPad Games' started by Klemens, Dec 3, 2014.
my name is Klemens Strasser and I'm the developer of a little game called Elementary Minute. Currently, there are three topics available in the game: First up is Math, which is all about elementary math (+,-, *, /). Geography asks you about Countries, Flags, Rivers, Mountains, Cities and Sights. The newest topic, Famous People, is about the most influential people of the human history. You will get statements about Actors, Sportsman, Musicians, Directors, Politicians and Authors, Scientists and more will be added soon. The game has to modes: Classic and Rush. 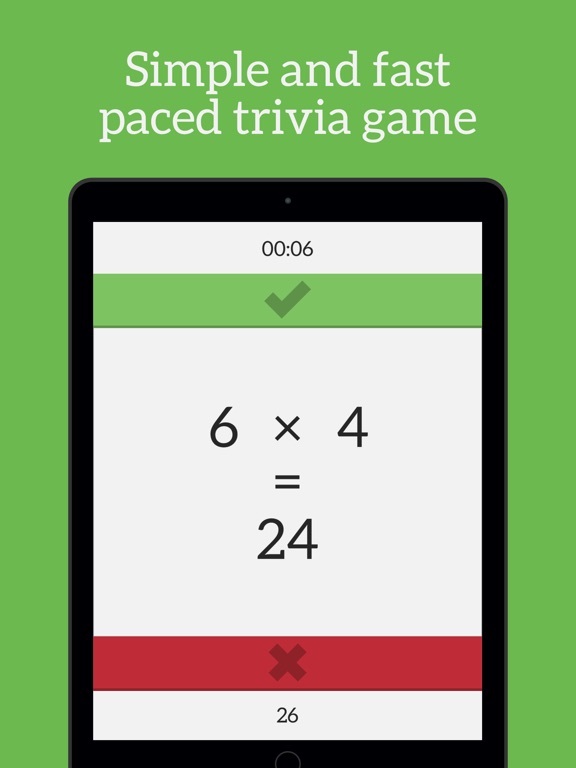 The first one gives you one minute to get as many answers correct as possible. If you get one wrong, you loose a live. Rush puts you to a stress test. Here, you get only 5 seconds per question and four lives. While a correct answer gives you a point, a wrong one takes away one live. I hope you like it and would love to here feedback from you, to make the game even better! This is actually a fun little game. If you are the one who got it, have fun! And it would be awesome if give me some feedback for it! In the last few days, three updates where released! They brought an easier geography mode, a new icon, a German localization and a few bug fixes. Apple Watch Update out now! Elementary Minute just got an Update with support for the Apple Watch! Hope you enjoy it! Can't believe I just saw this post only now. From the trailer, I like the variety of questions for math and geography categories. Also, like the swipe up and down mechanic and the data to see how we did. 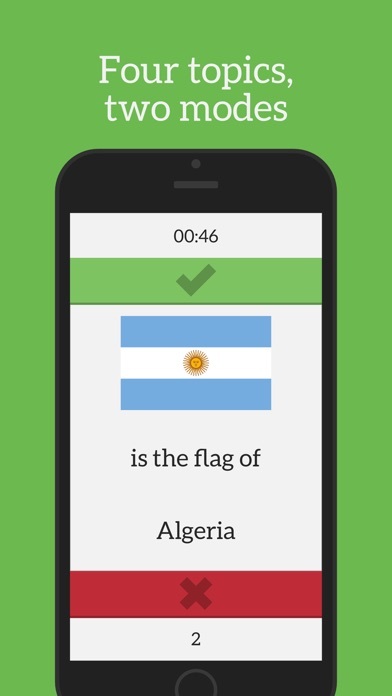 I subscribe to the PEAK brain training app, so this appears to be up my alley. 3. Do questions adjust by getting easier or harder based on how we answered previous rounds? So, that's a hard one. I have certain rules to create all questions Randomly. 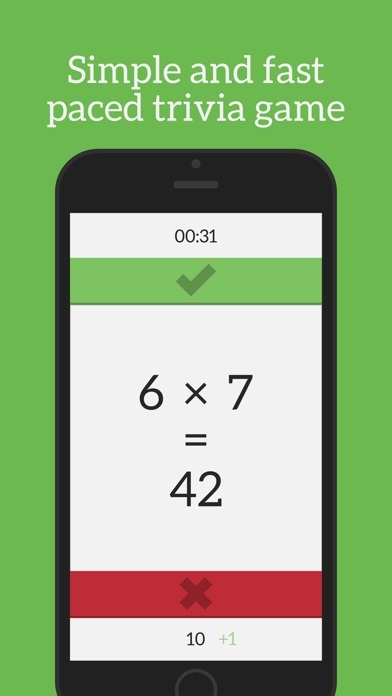 For example, in Math classic easy there are two numbers from 0-9, which are randomly chosen. Than the game choses an elementary sign randomly, calculates the result and randomly choses if the result should be modified (to be incorrect) or not. In harder modes, the range of numbers is bigger. In the other topics (Geographie and Famous People), I have Databases, choose randomly a question, a country or a person, an fact about it and sometimes modify one of the three things to make the statement wrong. The size of the geography databases is limited to the number of countries. Depending on the mode the three biggest cities + capital of each country, the flag and country code of each country, about 60 of the world largest rivers, about 70 mountains, over 100 sights and more to come. But, the databases are expanded frequently, in the version 1.1 I've added a whole new topic and two new questions for geography mode. 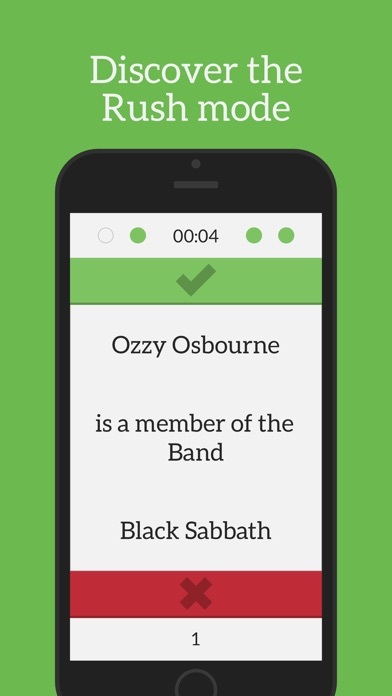 the next update will feature more than 80 new musicians, 50 new movies, outlines of countries and more. And a new topic is in planning. Currently, no. But I'm working on this feature, because it is really important for the next new topic, which will arrive later this year. No, not directly, because like I said earlier, all questions are chosen randomly. But in rush mode, things are getting harder if you survive a certain amount of questions. First of the game's visuals are nice and simple, though not boring. I find it refreshing, coming off of trivia crack. There is only a right or wrong answer which build on the simplicity, so no choosing out of multiple answers. There are 4 categories at the moment: Math, Geography, Famous People and Science. 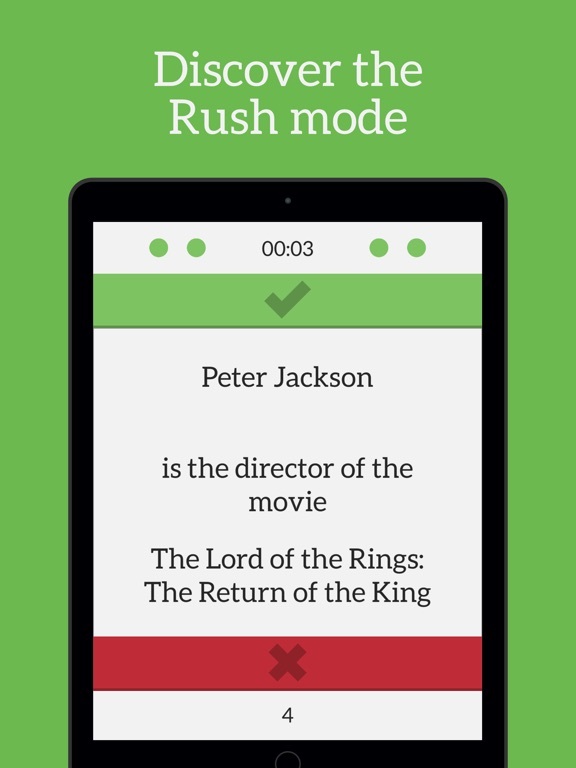 Each Category has 3 modes: Rush (you have 5 seconds for each question), Hard and easy (You lose 5 Seconds if you make a wrong answer, out of 60 seconds for a game, so less wrong answers = more time = more right answers = score). 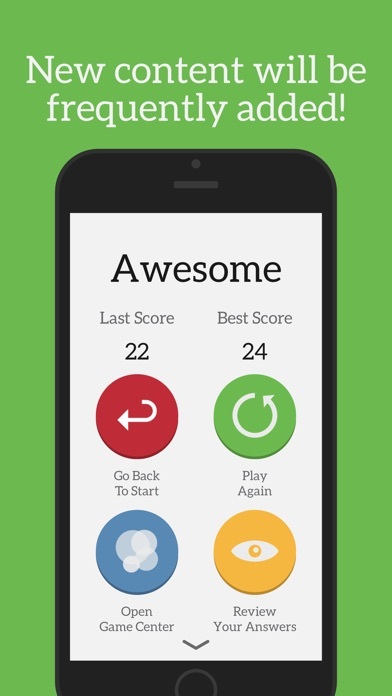 Your score is uploaded to gamecenter and comes from how many questions you answered correctly in the given time, in Rush you only have 4 failures allowed. What I really like is the simplicity of the game in design but also in the fact, that you only have a choice between right and wrong. This makes for a quick and easy gameplay. While you can swipe up or down to mark a question as right or wrong, I would love 2 easy to reach buttons for one-click playability, but that is very minor. Controls still work great. The Math questions are pretty easy to answer and most questions - at least I think for "experts" in their fields or people that area really interested in one or more categories - are in that vein. This does not say everything is easy. I found myself struggling with multiple questions and even though I only played it very casually, I am no where near any highscore. What really stood out were the georgraphy questions, where you would be shown a shape of a land and judge if it the netherlands e.g., same with flags. This is really cool, as I think that this could be improved and expanded upon in great way with pictures and other things. I really liked that it is not strictly text based. Where I think this game show a true lack is in it's depth. I came off of Trivia crack and the lack of real competition is something that really got to me later on. Sure you can chase highscores but it is something different to play against a real opponent who answers the same questions and surpasses you or falls short. Another personal thing is the lack of a history category and I could see this being a major turn off for most people that are totally not into those nature sciences or famous people, there is just not much else to challenge your brain about. I cannot stop thinking about the potential of this app though and as all of those questions presumably are checked and made by the author the margin for error is relatively low (trivia crack has quite some errors in their questions as it is user created content). 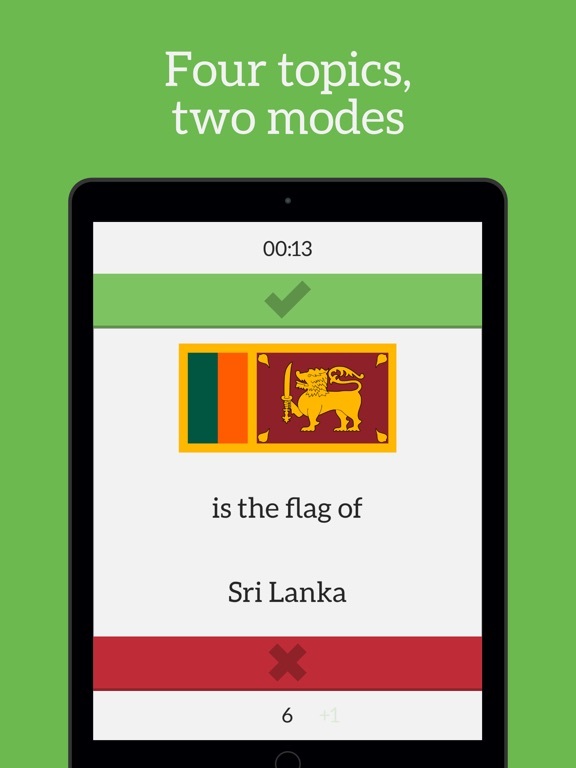 Lastly the lack of translations are most likely a budget issue and I totally understand them but I have yet to find a good trivia game on german (native speaker) other than trivia crack games and I think this should be mentioned. So overall, if you are into those 4 categories I mentioned at the beginning, I can really recommend this game for the asking price of 99 cents. It is easy to get into and the play sessions are short and fun. While there are some cool elements in there I found the overall lack of diversity in categories to be a major turnoff for me. The game has great potential though and I would love to see this expanded with more categories and content, as I would most likely return to it. For now though I will put it on hold as my favorite topics are not in there and nature science is not really mine. If you like those though, go ahead and pay the 99 cents, it's worth it and the dev is very communicative as evidenced by this thread.